Miami Beach 411 > Orlando > Disney > Hotels Near Disney > Quality Inn Plaza > ¿Hablas Español? This page allows you to make reservations, find directions, and submit reviews about the Quality Inn Plaza. The Resort is located approximately 232 miles north of Miami Beach, Florida. If you need transportation, take our $35 shuttle bus. 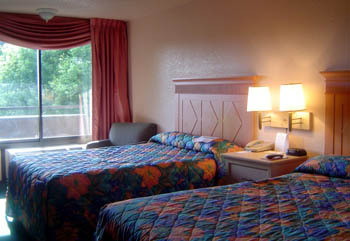 Click HERE for Quality Inn Lodging Information. Quality Inn and Suites is a large hotel comprised of 6 buildings. The property has a restaurant, sports bar, game room, playground, and 3 swimming pools. Nearby restaurants and attractions that are within easy walking distance to the Hotel include: Subway, Pizza Hut, Sizzler, T.G.I. Fridays, Johnny Rockets, Hooters, Bahama Breeze, Cattlemans Steakhouse, Walgreen's Drug Store, Muvico Pointe 21 Movie Theatre, and over 80 restaurants and stores at Pointe Orlando Shopping Mall. Free transportation to Universal Studios, Sea World and Wet 'n Wild from Quality Inn Plaza is available by: Bus. 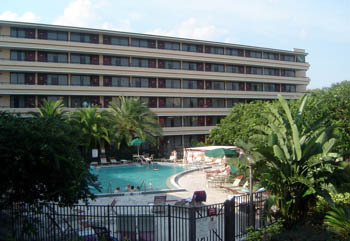 Quality Inn Plaza is just southwest of Orlando, off Interstate 4. Use our Disney World Google Map to find the exact location.